Here are some of the most common questions we get asked, if you don’t see your question on the list, feel free to just give us a call or pop by one of our shops! Contact your insurance company and report the accident to begin the claims process. Tell them you choose to have your collision repairs done at Higgins Body & Paint, Inc. Contact us directly and we will guide you through the process. We are a Direct Repair facility with most Insurance Companies. This means we will make the process simple and quick for you. Do I need to bring anything with me for my 1st appointment? You will need to bring your driver’s license, a major credit card if you are planning to rent a car. Even if your insurance company is paying for your rental, you will still need to have a credit card on file with Enterprise Car Rental. Do you have access to rental cars? Enterprise Car Rental is located in each of our collision repair facilities for your convenience. Please make sure you call prior to coming in to drop off your vehicle to be repaired. You may call the Higgins Body & Paint location that is going to repair your vehicle. Should I drive my car after an accident? It really depends on the extent of your damage. Generally speaking, if you have any lights out, or your car doesn’t feel “quite right” to you, or parts are rubbing on tires, give us a call and we can arrange towing. You may also request to have your vehicle towed to our shops direct from the accident scene by using our mobile website. We can best determine your vehicles safety if you drop by any of our locations. We use BASF paint products. 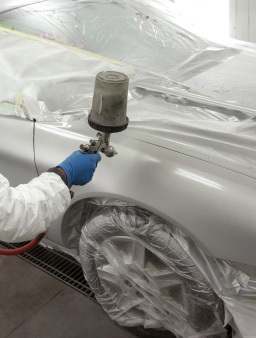 Our paint technicians are BASF and I-Car certified. We not only have certified technicians but have the latest in equipment to match your factory color and finish on your vehicle. Your vehicle is then carefully refinished in our state of the art down draft paint booths and baked to ensure a durable long lasting finish.